Unlike the past few years, this December found me staying put in Dubai (except for a short trip to Oman for my birthday, but more on that in another post), so I took advantage of the cool temperatures to explore the country outside of the city and spent all my weekends hiking, camping and enjoying spectacular sunsets. 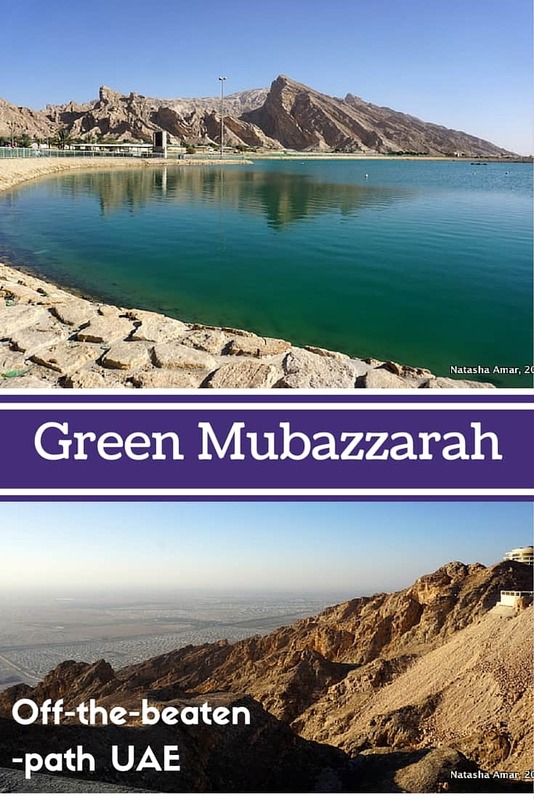 On one such weekend, I had the chance to visit Green Mubazzarah, a little known secret spot at the base of the Jebel Hafeet mountains in Al Ain. Not many people living in Dubai are aware of this place and admittedly even I had only visited several years ago on a school trip and had no idea how much it had developed since. 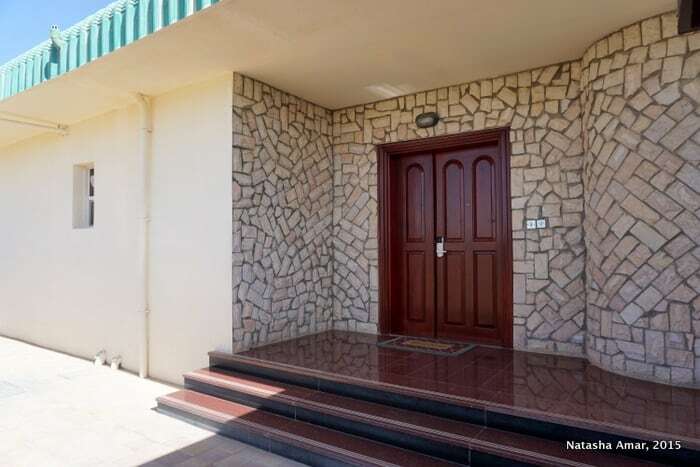 Green Mubazzarah, at the base of Jebel Hafeet, is home to many hot springs, a lake, park, lush green meadows, a campground, and offers 200 spacious chalets (one and two-bedrooms) for rent. Surrounded by rolling green hills and the rugged scenery of the mountains, these chalets are ideal for a weekend in the middle of nature, something that should be a prized getaway in the U.A.E. 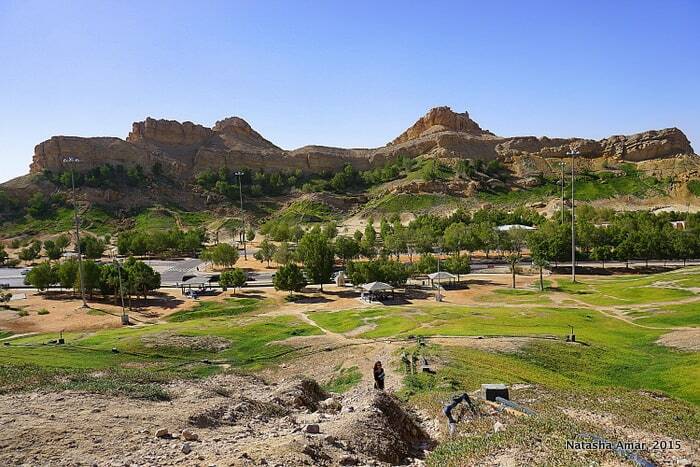 When I first arrived in Green Mubazzarah, I almost couldn’t believe that it was only an hour and a half from Dubai. A perfect getaway so close to the city- I’ve already made plans to return with our camping gear. 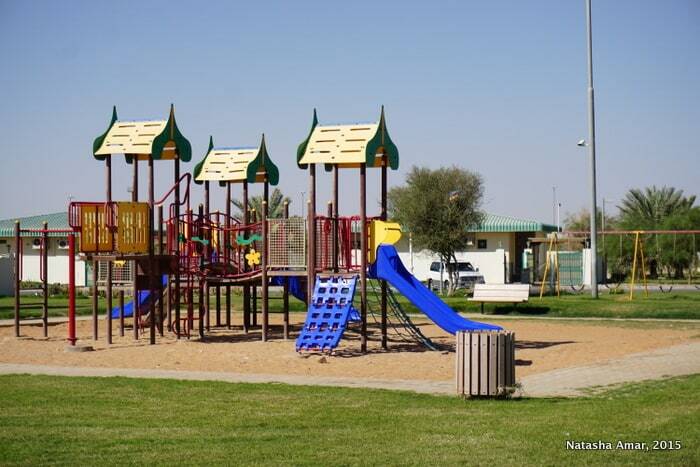 Whether you’d like to rent the chalets or set up camp in the Camping Area, this place is great for spending a few days to relax with the family over barbeques and picnic lunches, enjoy the scenery and drive up to Jebel Hafeet for a splendid view over Al Ain. We found ourselves staying in a beautiful two-bedroom chalet that felt just like home. It came with an equipped kitchen, a living room, two bedrooms, two bathrooms (of which one was common), and it’s own garage. The chalet was huge and could easily fit a big family of four adults and four kids. We liked the classic décor and warm color palette of mahogany, brown, rust, cream and gold, and dark wood in the interior. 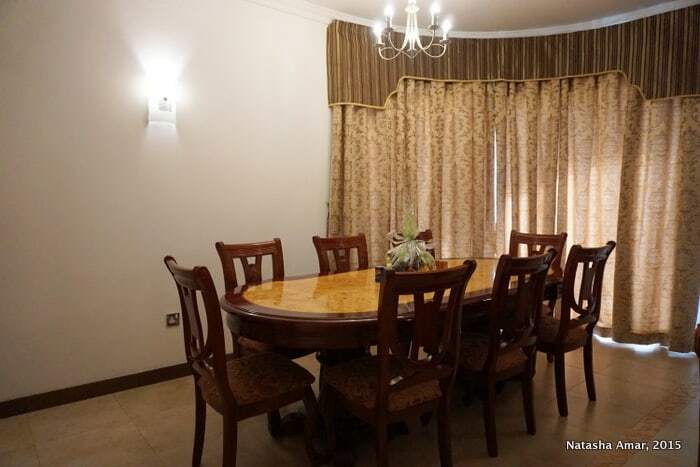 The living room was spacious with separate TV and dining areas. We felt so at home in the chalet that we decided to stay in for dinner after we’d returned from Jebel Hafeet, and were happy to learn that the local restaurant Al Sahra in Green Mubazzarah had delivery service for the chalets. 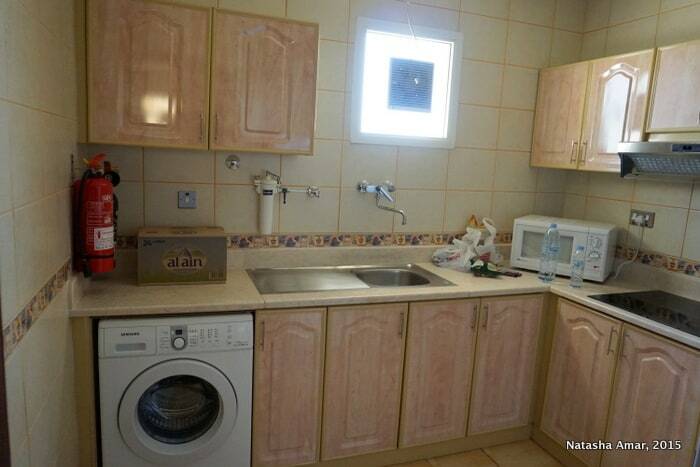 For those who’d like to cook their own food, the kitchen is equipped with a refrigerator, stove-tops, microwave, electric kettle, cutleries and washing machine. 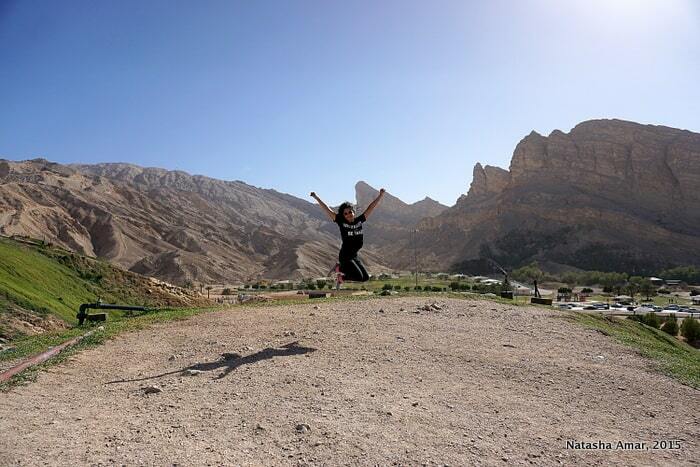 This is something I’d love to do when I stay again at Green Mubazzarah Chalets. A barbeque grill is also provided. The master bedroom was also spacious with a comfortable king-size bed (we slept like babies), a TV, dresser, a walk-in closet and an ensuite bathroom. The second bedroom with twin beds was almost as big. The chalets are planned and designed to provide plenty of space and privacy, and good for those who like that aspect. For any requests, the helpful reception staff is just a phone call away 24 hours a day. Right outside our chalet was a manicured lawn with a children’s play area. 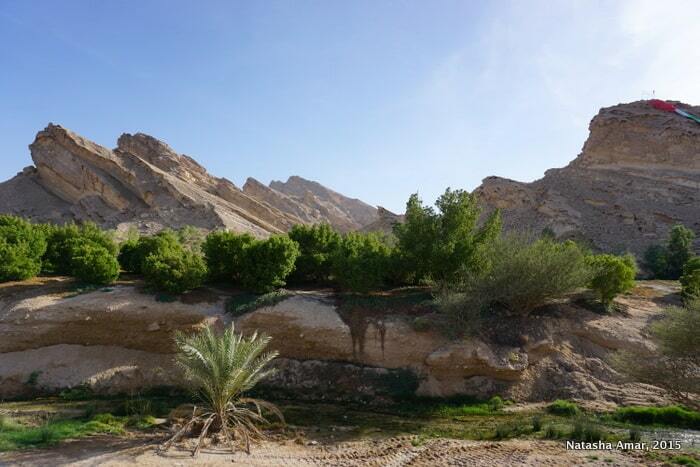 Green Mubazzarah is the kind of place you go to get away from it all and is miles away from city life in the U.A.E. For someone like me who loves being in the middle of nature and far away from skyscrapers (as much as I can), Green Mubazzarah would be the ideal base from which to explore the city of Al Ain (more about what to do in Al Ain in a later post) as well as just relax and enjoy the cooler temperatures in and around Jebel Hafeet. Don’t come here looking for a raging nightlife or super fancy restaurants or anything of that sort- this is a simple place with enough natural beauty to keep you interested for a few days. Green Mubazzarah is very popular with local families and those who appreciate the peace and tranquility of this easily accessible retreat. Dip your toes in the 40°C waters of one of the hot springs gushing around in the area. The source of the springs lies underground and the water escapes to the surface through fractures in the earth caused by seismic activity. On weekends, you can see plenty of families and children enjoying the hot springs and in the winter months (November-February), it can get a little crowded, especially on public holidays. The afternoons are still quite warm and sunny so it’s best to enjoy the hot springs very early in the morning or late in the evenings. 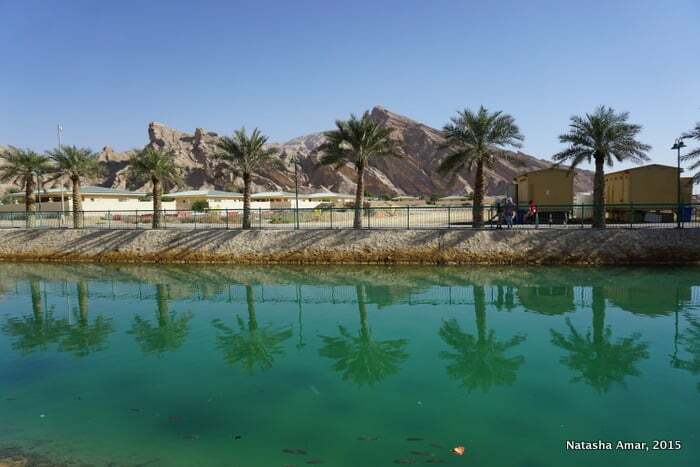 The Green Mubazzarah Lake makes for a picture-perfect setting- walk or jog along the perimeter of the manmade lake, feed the fish in the lake or simply relax on one of the benches by the lake, taking in the pleasing landscape. 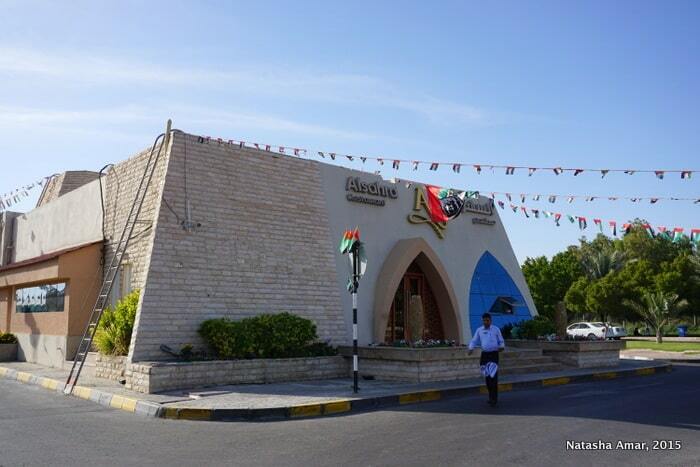 The swimming pools in Green Mubazzarah are housed in separate buildings for men and women, understandably, as a lot of the planning was done with the comfort of local visitors in mind and to uphold Emirati culture. There are two buildings each for men and women, with shower and changing facilities. 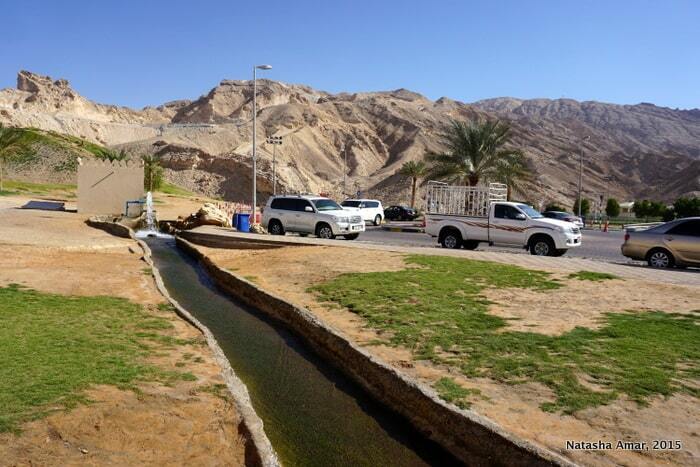 The water in the pools is hot and is sourced from the natural springs. 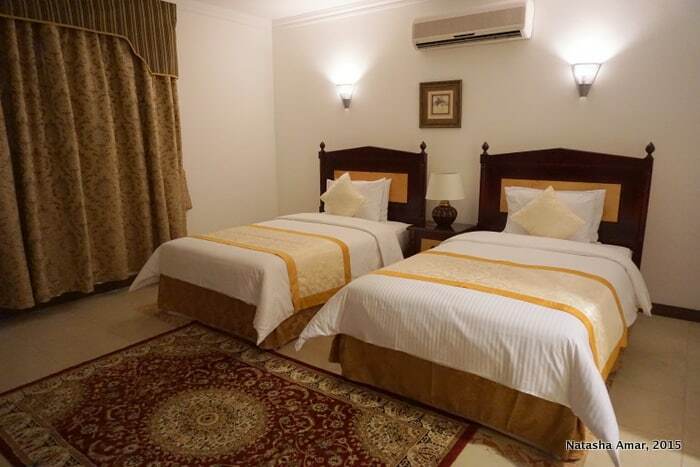 There are day entrance fees (AED15 at the time of writing) to use the pool facilities and it’s open to all visitors, even those who aren’t staying at Green Mubazzarah Chalets. 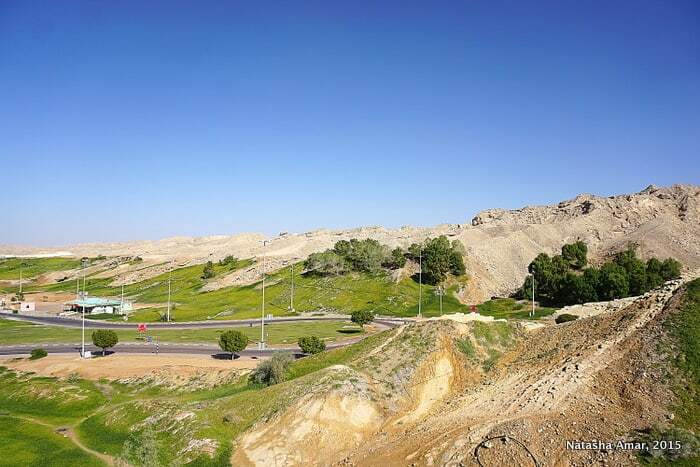 Adventure lovers can combine a stay at Green Mubazzarah Chalets with an excursion to neighboring Wadi Adventure, an adventure park at the base of Jebel Hafeet with fun activities such as man-made whitewater rafting, kayaking and surfing. The trip makes for an exciting day of adventure in a beautiful location. Grab your barbeque grill, picnic baskets, tents, mats and loungers and head to the barbeque and parks area to relax with the family, your significant other or a gripping novel. Surrounded by lovely green hills and Jebel Hafeet in the distance, there’s nothing you’ll feel more under the shade of a tree than quiet contentment. We were lucky to be let in on a few secret spots and walking paths in the area that are great for birdwatchers and can feel a world away from the more popular picnic grounds, and with enough time to explore, can say we loved those. Want to know more? 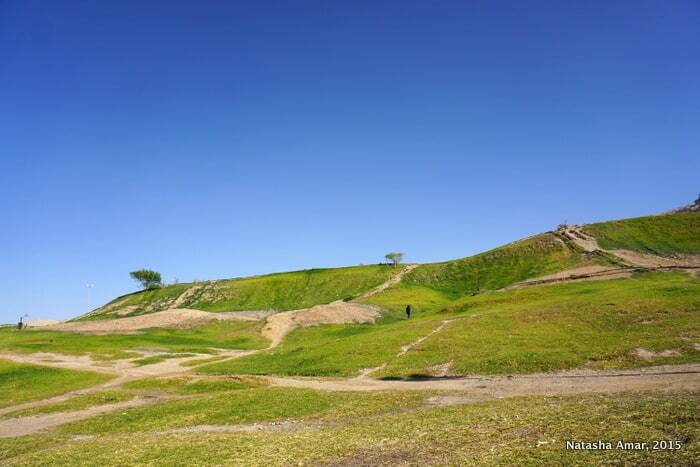 It’s best to allow yourself to get lost within Green Mubazzarah. 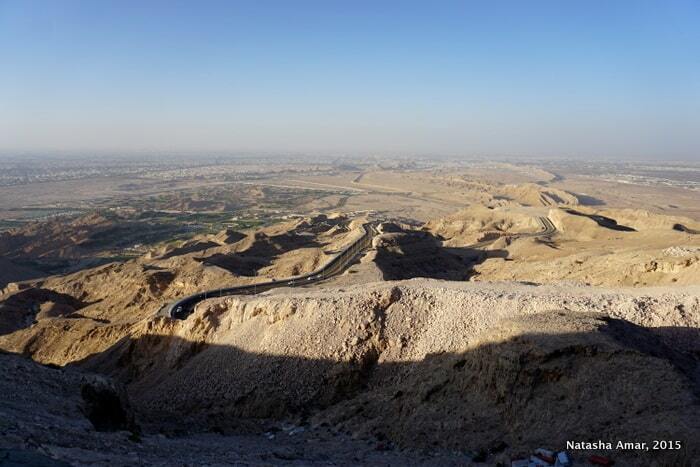 A drive all the way to the topmost viewpoint of Jebel Hafeet is just a twenty-minute long affair from Green Mubazzarah, so there’s no excuse to not make it in time for a rose-gold sunset over the city of Al Ain. The driving road is in excellent condition and suitable even for sedans, so not to worry if you don’t have an SUV. Though there were a couple of F&B outlets in the area such as a Pizza Hut (that was closed the afternoon we visited) and other one or two cafeterias, we kept going back to Al Sahra Restaurant, a simple place with an indoor area and outdoor seating to enjoy the beautiful valley views, after we enjoyed our first meal there. 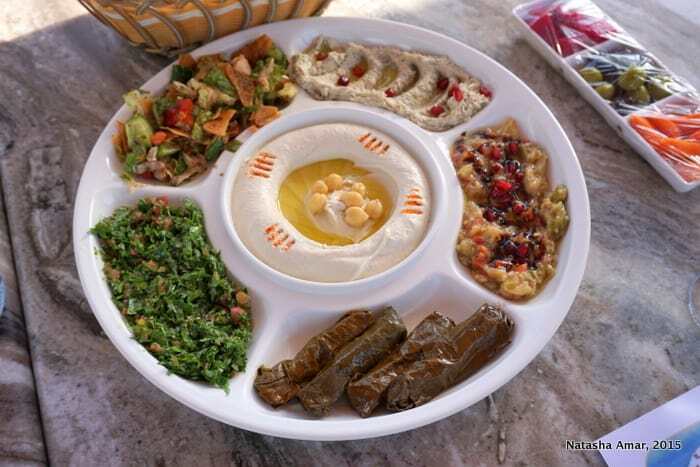 The menu is a mix of Lebanese cuisine and international favorites such as pizza, pasta, burgers and sandwiches. 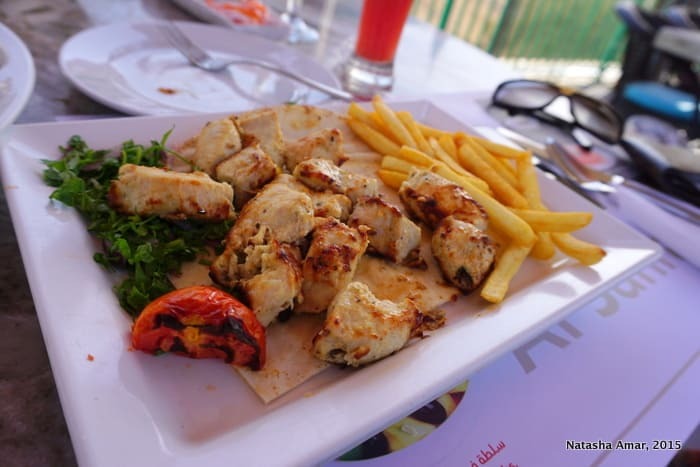 A special mention must be made of our lunch of delicious grilled Hammour (fish) fillet, succulent Shish Taouk (grilled chicken on skewers) and addictive (yeah seriously) hummus. Al Sahra also has delivery service to the chalets and what’s more- it’s 24 hours! They also serve shisha. Opened to the public in 2004, Green Mubazzarah is a project that was very dear to His Highness Sheikh Zayed bin Sultan Al Nahyan, the founding President of the UAE. 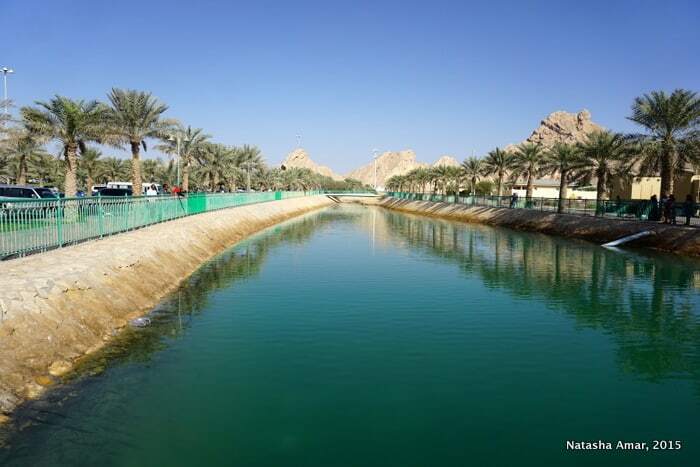 He envisioned the area as a tranquil retreat for the Emirati population and encouraged them to visit on weekends to spend quality family time in the midst of nature. 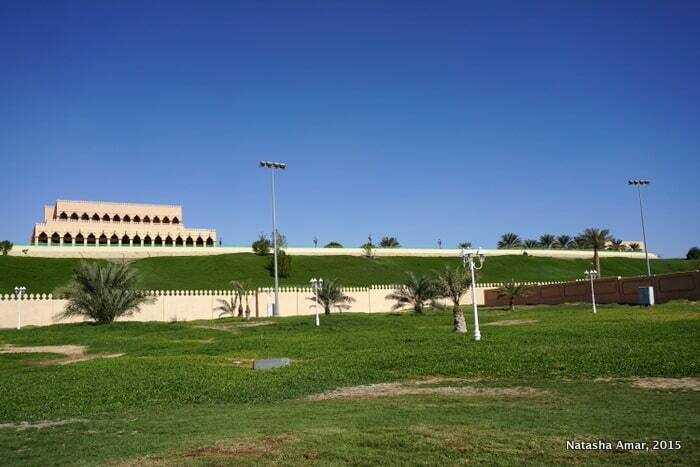 His palace still stands overlooking Green Mubazzarah and he would often visit and stay for days. 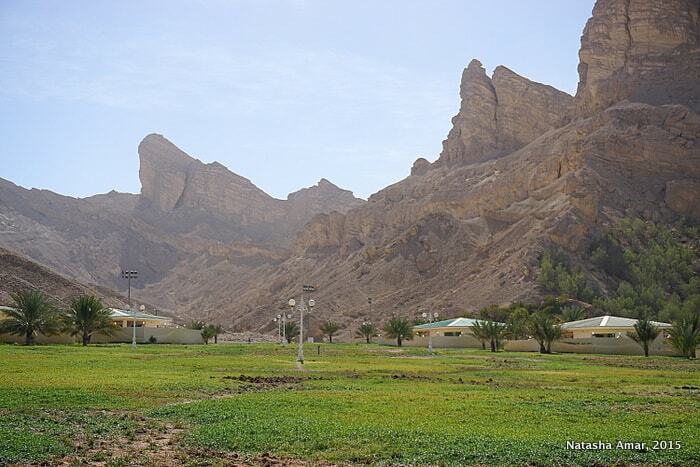 During his visits, free meals would be served to the visitors in Green Mubazzarah as a token of goodwill. Also known as the ‘Father of the Nation’, Sheikh Zayed’s love for nature is well-known, (perhaps as he originally hailed from the fertile oasis of Al Ain, the ‘Garden City’) and was evident in his keen supervision and planning of the development of Green Mubazzarah. Connect with Green Mubazzarah Chalets on Facebook and Twitter. You can also download their CreateTrips TravelBook for free to have all of this info on your phone. If you’re looking to get further away from Dubai or Abu Dhabi on a long weekend, why not check out a cheap flight some place new with Flydubai– there’s always somewhere affordable to stoke your wanderlust! Disclosure: We stayed as guests of Green Mubazzarah Chalets. All opinions as always, are honest and independent. Great list of places shared ! All looking amazing! Staying at such beautiful place would be a great experience for everyone who have never been there like me. 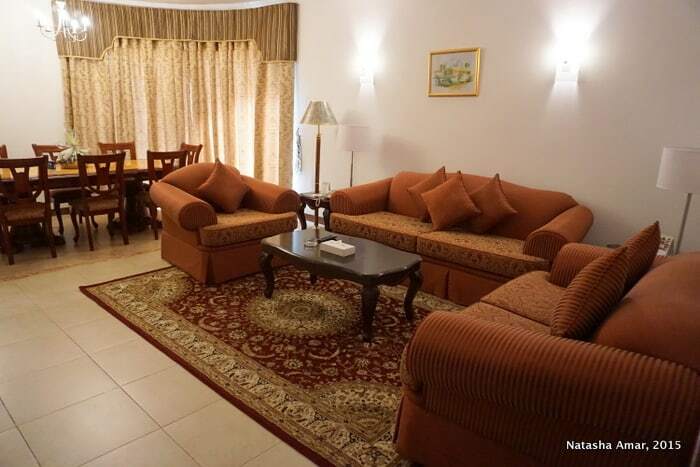 The best thing is Dubai is not a much expensive…everyone can afford staying here! I think it’s the best place to visit for all! keep sharing such quality stuff! I would surely look forward! 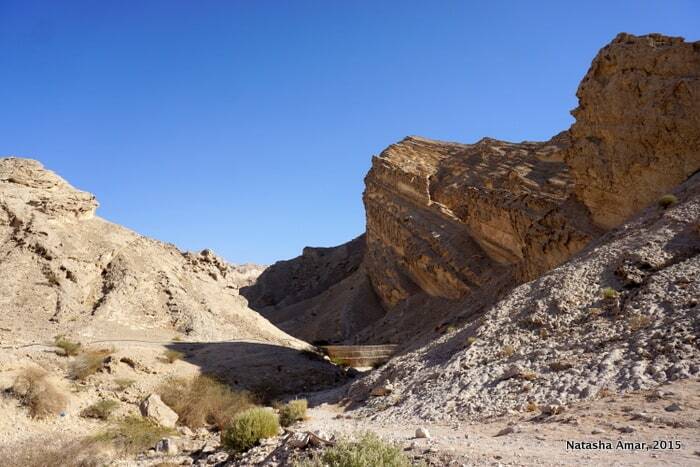 So much to see and do in Abu Dhabi… one can never imagine beautiful springs with hot waters in this desert landscape..! I have never known much about Dubai, and found this article very informative and fascinating. The Green Mubazzarah and surrounding area is very beautiful. 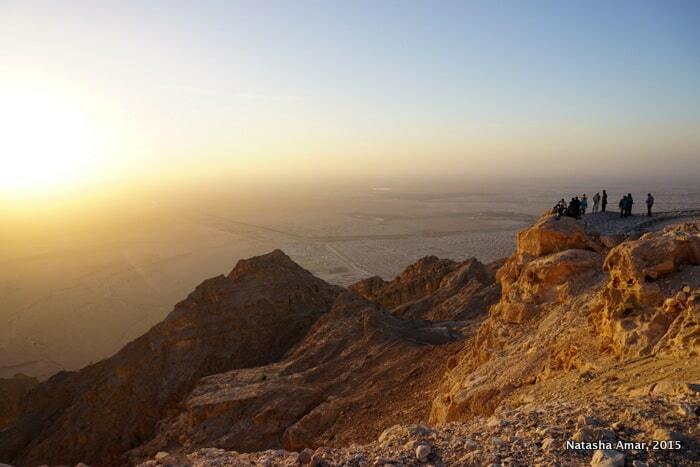 Jebel Hafeet looks incredible. Definitely adding it to my list ? This looks an awesome place to stay, beautiful little chalets surrounded by even better scenery! The food looks great too! What a great place to stay! 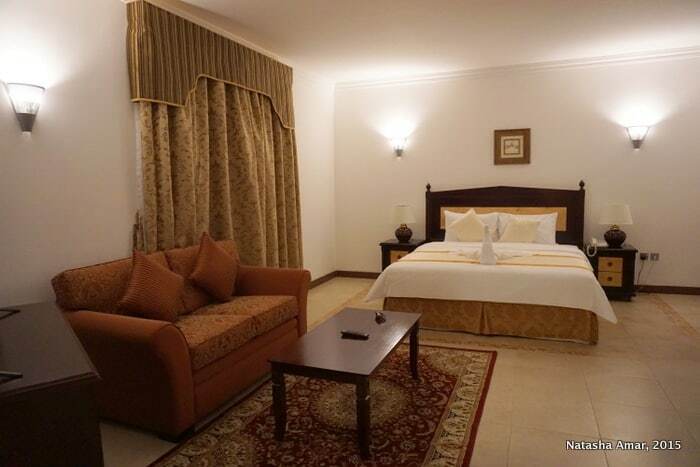 I love that you have hiking, swimming and nature just outside the door to your room. 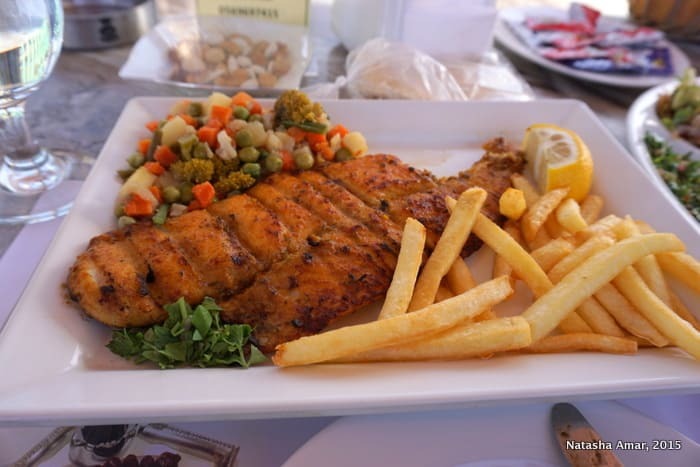 Along with the food that looks delicious what else do you need to have a good getaway, its all there! The setting here reminds me of my home in Las Vegas, Nevada. Dessert in the valley. It seems like there’s a lot of photogenic corners here too! You won me at ‘do nothing’ except of course eating. The food looks fab. Would to head to the UAE at some stage this year.